Tonight I tried an interesting experiment that worked - I made bagels, from scratch. This is, however, not the most practical recipe. It was actually relatively easy, but doesn't necessarily make sense since I live in New York and could buy some of the world's best bagels fresh in a snap for about .60 cents a bagel. If you don't live in New York and don't have such access, perhaps then this is a good solution. However, I have been told that they key to amazing New York bagels comes from the mineral content of NYC tap water (since bagels have to be boiled in this water), which is obviously not available outside of New York. I have been eating bagels for years and after nearly 10 years in New York, I think I've tasted some pretty good bagels. In all fairness, I have tasted some pretty bad bagels. As a small child in central PA (not bagel country, certainly), my Dad made me lenders frozen blueberry bagels with peanut butter for breakfast for awhile. For some reason, rather than telling him I didn't want to eat these (I was like 7 or 8 and ate like a bird as a kid), I decided to stuff the bagels inside the radiator vents in the kitchen. I might have done this about 15 times or so when I finally got caught. Not please, my Dad asked me if I had ever done this before. Not wanting to get in trouble, I assured him this was a one time mistake which I would not repeat. My days of eating frozen lenders bagels were then over, thankfully and I soon completely forgot about my bagel-hiding. Years later, in about 1998 when I was in college, my parents redid their kitchen. They were quite surprised to discover 15 or so completely petrified (12 year old) bagels still inside the radiator. Amazingly, they had not had any other problems (mice, radiator fires or bugs) over the years. The full recipe I used with instructions is here. I do not have a professional bagel cooking machine so I just boiled in a large pot. In addition, I used King Arthur Bread Flour, which is just about the best bread flour out there. I could not locate malt syrup at the grocery store where I shop(I am sure I could have if I hunted it down a bit). The guy at the store had no idea what I was asking me for and kept suggesting that I buy maple syrup or chocolate syrup. I did find online that unsulfured molasses is a good substitute for malt syrup, in that the viscosity and sugar content is similar (perhaps a tad sweeter), so I substituted that. To get the glossy color, glaze with an egg white, mixed with 2 T of water, using a pastry brush, before bakign at 425 F for about 25 minutes. 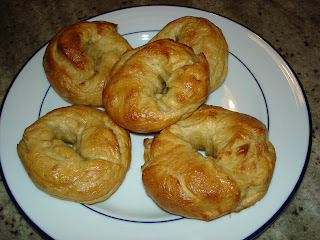 Following the instructions on the recipe, the bagels were pretty easy to make and fun. They cam out slightly lumpy, but general bagel-like. I am not quite sure how they measure up to the very best New York bagels, as I think that a place like H&H has a distinct advantage. 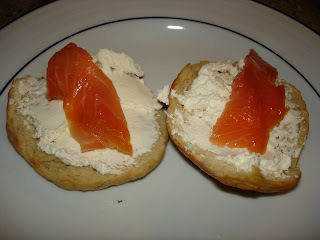 However, they were pretty tasty and made for an enjoyable meal with lox and cream cheese. To make the dough, first blend the butter and sugar in the basin of that artisan mixmaster I've been talking about. Then blend in the other ingredients. The walnuts should be processed first into a powder. Next, let the dough chill for 1 hour in the refrigerator. 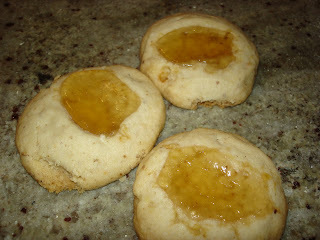 Then form into cookies and press an indentation or "thumbprint" into each cookie and fill with jam. I chose to use quince jam. The bake for 13-15 minutes until lightly golden at 325 degrees F. Quince is a somewhat sweet, but also tart fruit. Obviously other jam flavors could be substituted.